I think the whole ethos behind the evolution of the Porsche 911 can be boiled down to, “More of the same, just slightly different.” And it’s easy to trace those differences because the 911 is one of the longest-produced models we currently have. The interior alone is worth a closer look. During the 2020 Porsche 911's media launch earlier this month, Porsche trotted out the seven previous generations of its rear-engined car, on loan from the Porsche Museum in Germany, to join the newest one being shown off in Spain. It was a striking aesthetic choice because you could starkly see how much larger the newest 911 is compared to the old one. But it also gave me an opportunity to peek inside. 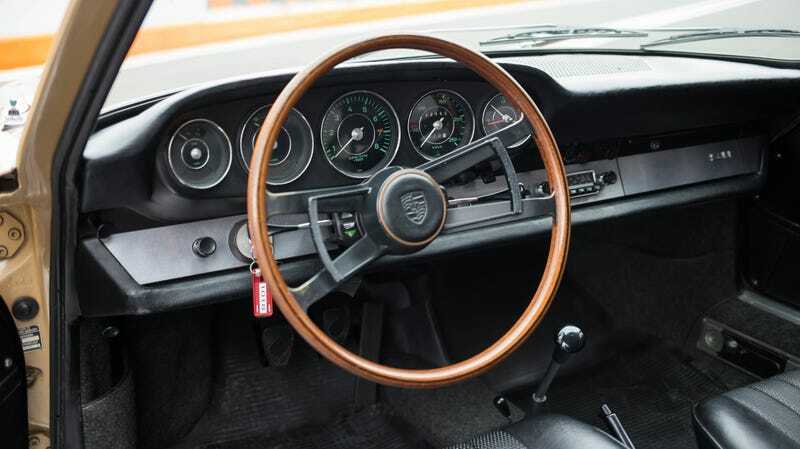 Much of the 911's rabid fandom boils down to “tradition,” in which the general layout and design of things don’t change very much over time; the five-gauge cluster, for example. People seem to like this. The first 911 succeeded the Porsche 356 in 1963. Obviously, it’s missing nearly all of the safety features that you’d expect a modern car to have. But that’s why the cabin is so damn airy. Everything—from the thin, wooden steering wheel to the open footwell—gives off a sense of space. The windows are large, the belt-line is low and the pillars are thin. Is this car safe in a collision? Definitely not. The gauges are spread out and easy to read here, tastefully encircled in silver. The speedometer tops out at around 155 mph. I really like the green lettering. Ten years later, in 1973, Porsche began producing the G-Series. The focus here, thanks to U.S. influence, was on safety. That’s why things look a little less sparse, the steering wheel looks a little less lethal if you suddenly got smashed into it. Unfortunately, though, the joint front passenger footwell is no more. Top speed on the speedo increased, too, to about 162 mph. The gauges are no longer outlined in silver, but the needles are orange, which is a nice touch. The G-Series is also the generation that saw the first 911 930, or the Turbo. This is from a special-edition 964, hence all the purple. But it’s still the same layout as the others. Amazing what an airbag will do to the shape of a steering wheel. The shifter is now shorter and the speedo reaches 186 mph. The cars are definitely getting faster! This is also the generation, which debuted in 1988, that saw the first all-wheel drive Porsche: the highly advanced 959. In 1993, Porsche unveiled the 993-generation. With it came the first six-speed transmission fitted to a 911. Its interior isn’t hugely different from the 964's. Buttons and switches replaced dials in a few places. But this is also the very last generation of 911 to offer an air-cooled engine. The 996 might be the most divisive generation of them all. It came out in 1997 with fried eggs on is face, a water-cooled engine and, uh, this interior. I won’t lie to you, I am not a fan. Everything just looks that much more squashed together. The design uses a lot of ovals, which gives off a very blobby feel. I hate that the gauges are now closely stacked together. I hate it. And, to make room for the screens that were becoming prevalent in all cars during that time, the console layout became a much more vertical-oriented one. Things get a little more cleaned up in the subsequent generation in 2004. The interior gets slightly less fussy, there’s more breathing room between the five gauges. But the vertical layout is still there. This is also the generation where Porsche introduced things like its PDK gearbox, the PASM suspension system and direct injection. Isn’t it neat (or not) how you can see the transmission hump keep rising with each generation? It used to be at least even with the front seats. Now it’s towering over them! Porsche introduced the seven-speed manual for the 991 generation, and all Carrera models went turbocharged for the 991.2 generation. Gauges are still clumped together, though. And there are just so many buttons. Buttons everywhere. The 992 returns to the separate five-gauge cluster, but now four of them are digital. I guess this is our new reality. The good thing, however, is that the interior design has finally gone back to the horizontal layout from the 1960s. The transmission hump is as tall as ever, but the gear selector on the PDK models is tiny. Just a lil nub. Cute. I know that each 911 has gotten bigger than the last, so theoretically interior space should also have increased proportionately. But when I have all eight of these photos lined up, visually they seem to get tighter and tighter and tighter. I’m sure much of it is for safety, because airiness and thin support beams are probably bad in a crash, but I think it’s also evidence that our cars are just jam-packed with so much stuff in general. What will the next 911 interior look like? I have no idea, but I can at least count on a left-hand ignition and some kind of five-gauge layout.